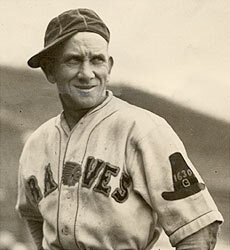 On July 21, 1933, in a game against the St. Louis Cardinals, Boston Braves infielder Rabbit Maranville hits the final triple of his career. It is his 103rd triple in a Braves uniform. Maranville still holds the Braves franchise records for most career triples. 1934 would be his last season. Rabbit Maranville, even at age 42, was playing some pretty good ball so there was hope as the season started. It was his 24th season and he had become a Boston and National legend.It was a so so season for the Braves in 1934 but the worst part of it was losing Rabbit Maranville. They had a 78-87 record finishing 16 games behind in fourth place. It was Bill McKechnie’s 5th season but this went the way most of them did during his tenure.